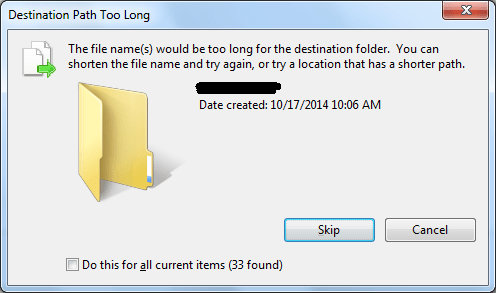 The file name(s) would be too long for the destination folder…. I got the error on my Windows 7, SP1. Of course, you can have the same issue on Windows 8. I use Windows Explorer to try to copy files or folders in order to paste them into some other folder. There is a solution and explain already by Microsoft on the support that the problem occurs because of an issue in how Windows handles the long-path errors. You can apply the official HotFix (Fix475608) as stated in Microsoft’s Support, you need to read if your issue as describe as in the ticket or not and ask the hotfix via mail. Or if you are using Windows 7, SP1, 64bit as mine and has the same issue as above, you can download here (at your own risk). I have already used both alternative and hotfix. All works for me. It brings general solution for Windows User. Use “Long Path Tool”. It will solve this problem. Yes, I’m agree; In some case, the fixed by Microsoft’s patch cannot solve the issue but the “Long Path Tool” always works. Are you referring to Long Path Fixer (which you recommend in your article) or Long Path Tool, which is payware that uses spamming techniques (like the ones above and below) to promote their product? Thanks for your correction. I always support freeware for user (as in my post), first I didn’t think it’s different but it’s different, anyway, people could decide free one first I guest. I recommend Long path Tool Program to solve this problem. It is an easy task.